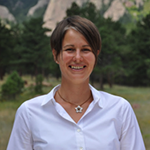 Jadwiga (Yaga) H. Richter is a scientist in the Atmospheric Modeling and Predictability (AMP) section of the Climate and Global Dynamics (CGD) Laboratory at NCAR. Yaga has received a B. S. of Science in Mathematics from the State University of New York at Purchase in 1997, and a Ph.D. in Atmospheric Sciences from University of Washington in 2002. She also holds a graduate certificate in Instructional Design from University of Wisconsin. Yaga has spent the majority of her scientific career at NCAR beginning with the ASP postdoctoral fellowship, with the exception of an Education and Outreach fellowship at University of Colorado. Yaga’s areas of expertise and scientific interests include gravity waves and their parameterizations in global climate models, middle atmospheric dynamics, quasi-biennial oscillation (QBO), whole atmosphere climate modeling, subseasonal-to-seasonal forecasting, and geoengineering. Yaga has developed the first source spectrum parameterization of convectively generated gravity waves in a climate model. Her improvements to the convective momentum transport parameterization in the Community Atmosphere Model (CAM) have significantly improved the representation of El Nino Southern Oscillation, and with her work on gravity waves and vertical resolution, she was able to obtain a very realistic QBO in the NCAR CAM and Whole Atmosphere Community Climate Model (WACCM). Yaga has a longstanding passion for education and outreach to audiences of all levels. In graduate school, she was the outreach coordinator for the Department of Atmospheric Sciences at the University of Washington. While an ASP Postdoctoral Fellow she developed the “Climate and Weather: The Two Go Together” Girl Scouts program at NCAR, which few years later became a part of the UCAR Center for Science Education. During this time she also taught Weather and Climate for teachers. Yaga also designed a “WeatherWise” badge program and kit for Girl Scouts while at CIRES/University of Colorado. Recently, Yaga lead the development of the NCAR Explorer Series which now continues as an integral part of the NCAR Education and Outreach offerings. In addition to informal outreach, Yaga enjoys mentoring graduate students and has hosted several graduate students through the NCAR ASP Graduate Visitor Program and the CGD Visitor Program. Neale, R. B., J. H. Richter, A. J. Conley, S. Park, P. H. Lauritzen, A. Gettelman, D. L. Williamson, P. J. Rasch, S. J. Vavrus, M. A. Taylor, W. D. Collins, M. Zhang, S.-J. Lin, 2010: Description of the NCAR Community Atmosphere Model (CAM 4.0), NCAR Tech. Note TN-485. Beres, J. H., M.J. Alexander, and J.R. Holton, 2004a: A method of specifying the gravity wave spectrum above convection based on latent heating properties and background wind. J. Atmos. Sci., 61, 324– 337. Beres, J. H., 2004: Gravity wave generation by a three-dimensional thermal forcing. J. Atmos. Sci., 61, 1805 – 1815. Beres, J. H., 2002. Gravity waves generated by tropical convection: generation mechanisms and implications for global circulation models. Ph.D. thesis Dept. of Atmospheric Science, University of Washington, 129 pp. Alexander, M. J., J. H. Beres and L. Pfister, 2000: Tropical stratospheric gravity wave activity and relationship to clouds. J. Geophys. Res., 105, 22,299-22,309.